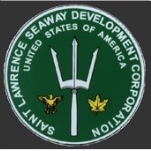 The Saint Lawrence Seaway Development Corporation is a Federal government entity that maintains, operates, and works to increase utilization of the two United States Seaway locks located in Massena, New York, and the U.S. portion of the St. Lawrence Seaway, between Montréal and Lake Erie. SLSDC is also responsible for vessel traffic control in the binational waterway areas of the St. Lawrence River and Lake Ontario, in collaboration with its Canadian partner, the St. Lawrence Seaway Management Corporation (SLSMC). The St. Lawrence Seaway Act of May 13, 1954 created the Saint Lawrence Seaway Development Corporation as a wholly owned, self-funded government corporation, with commercial tolls as its revenue source, and mandated the construction, operation, and maintenance of the part of the St. Lawrence Seaway between Montréal and Lake Erie that falls within the territorial limits of the United States. The Act also charged that management of the corporation be vested in an Administrator, appointed by the President, with the advice and consent of the Senate, for a term of seven years. In addition, the Act established a Saint Lawrence Seaway Development Corporation Advisory Board, to be composed of five members, appointed by the President, with the consent of the Senate, with not more than three of them belonging to the same political party. Their mandated responsibilities: Attending a meeting at the call of the Administrator at least once every ninety days. The Act also authorized the corporation to establish cooperation with the St. Lawrence Seaway Authority of Canada, particularly with respect to construction, navigation aids, overall day-to-day operations, rules and regulations, safety and environment programs, ship inspections, tariff of tolls, trade development, and traffic management. The U.S. and Canada shared the $470.3 million cost of creating the St. Lawrence Seaway; the United States paid $133.8 million, and Canada $336.5 million. On June 26, 1959, the Seaway was officially opened by Queen Elizabeth and President Dwight D. Eisenhower, and the dedication was held June 27, 1959, in Massena, New York. The Queen and Vice-President Richard M. Nixon took part in that ceremony. In 1966, with the creation of the U. S. Department of Transportation, SLSDC policy direction and supervision came under the responsibility of the Secretary of Transportation. In 1983, the Seaway carried its billionth ton of cargo. In 1986, Congress passed the Water Resources Development Act, which converted SLSDC from a self-financing entity to an appropriated agency, eliminating the U.S. portion of Seaway tolls. Since April, 1987, a major portion of SLSDC support has been through an appropriation from the Harbor Maintenance Trust Fund, which is made up of user fees paid by importers of international cargo, domestic cargo movement, and passenger vessels calling at designated ports throughout the United States. In 1992, SLSDC began working with the U.S. Department of Transportation’s Volpe National Transportation System Center, and Canadian partners, to design and implement Automatic Identification System/Global Positioning System (AIS/GPS) navigation technology. In March 1997, SLSDC and the U.S. Coast Guard, in conjunction with Transport Canada and The St. Lawrence Seaway Authority, signed a Memorandum of Understanding to develop a program of coordinated vessel inspection and enforcement activities to expedite the safe transit of shipping through the Great Lakes Seaway System. In 1998, operational control of the Canadian portion of the Seaway was officially transferred from The St. Lawrence Seaway Authority to the new non-profit St. Lawrence Seaway Management Corporation. In 2001, in an effort to provide its global customers with a single portal for news and information related to the Great Lakes Seaway System commercial navigation, SLSMC and SLSDC developed and launched a binational website. On March 31, 2003, U.S. and Canadian Seaway agencies began enforcing AIS use on commercial vessels entering the waterway in North America, as a requirement for transit. industry’s environmental footprint in the waterway, by addressing several specific issues, including aquatic invasive species, cargo residues, greenhouse gases, pollutant air emissions, and oily water. SLSDC, functioning in collaboration with the Canadian St. Lawrence Seaway Management Company, works to keep The St. Lawrence Seaway System operating as an efficient, environmentally responsible, reliable, safe, technologically advanced marine transportation system, while moving cargo such as coal, grain, iron, ore, and steel between North America and international markets. Each Seaway maximum size vessel carries roughly 25,000 metric tons, the equivalent of 870 semi-trucks, and the Seaway System encompasses the St. Lawrence River and the five Great Lakes, extending around 2,300 miles from the Gulf of the St. Lawrence at the Atlantic Ocean to the western end of Lake Superior at the twin ports of Duluth, Minnesota, and Superior, Wisconsin. Covering eight U.S. states and two Canadian provinces, the binational waterway serves as a deep draft waterborne link between major U.S. and Canadian agricultural, manufacturing, and industrial cities, including Chicago, Cleveland, Detroit, Green Bay, Milwaukee, Montréal, and Toledo, as well as European, South American, and North African markets. SLSDC and SLSMC jointly set and enforce regulations related to navigation and traffic control in the Seaway System. In addition, both entities perform inspections, for safety and environmental protection issues, of all ocean vessels heading into the Seaway. SLSDC is also solely responsible for the operation and maintenance of the U.S. portion of the Seaway, including the U.S. locks, ensuring that they are ready and available for commercial transit during the navigation season, usually late March to late December. Additionally, SLSDC performs trade development activities designed to enhance the utilization of the Great Lakes St. Lawrence Seaway System, aiming to attract the highest percentage of the world fleet possible. Those activities include hosting overseas trade missions at maritime and trade-related exhibitions, developing commodity-specific marketing plans, and working directly with carriers, importer/exporters, labor, ports, and terminal operators, in the development of promotional materials and initiatives. Since 1985, SLSDC has sponsored more than two dozen trade missions to more than 55 cities in nearly 40 countries. SLSDC also works with various Great Lakes Seaway System port authorities, the Great Lakes Cruising Coalition, the Great Lakes Waterways Management Forum, state and local governments, and tourism associations, to attract cruise vessels into the Great Lakes. SLSDC policy is generated out of offices in Washington D.C.; operation headquarters are in Massena, New York, and additional offices are located at the site of the two U.S. locks, Eisenhower and Snell, near Massena, N.Y.
Blue Cross and Blue Shield of Central New York, Inc.
Carter’s Trucking and Blacktopping, Inc.
what about the us and canada !!!!!!!! DUH! On July 24, 2013, the White House announced that Betty Sutton would be appointed administrator of the Saint Lawrence Seaway Development Corporation, a government-owned corporation that operates and maintains the U.S. portion of the St. Lawrence Seaway. A system of locks, canals and channels stretching along the St. Lawrence River between Montréal and Lake Erie, the Seaway allows ocean-going vessels to travel between the Atlantic Ocean and the Great Lakes. Born July 31, 1963, and raised in the Akron, Ohio, suburb of Barberton, Betty Sutton was the daughter of a factory worker and a clerk. She attended public schools and earned a B.A. in political science at Kent State University in 1985, and a law degree at the University of Akron School of Law in 1990. Sutton commenced her political career during her first year of law school, running for and winning an at-large seat on the Barberton City Council in 1990. A year later, she was appointed to an at-large seat on the Summit County Council and served until 1992, including service as the council’s elected vice president. That same year, at age 29, Sutton became the youngest woman ever to win election to the Ohio House of Representatives, where she served for eight years until term limits forced her to resign in 2000. Leaving public service, Sutton worked as a labor lawyer with the Cleveland firm of Faulkner, Muskovitz & Phillips from 2001 to 2006, where she worked closely with the International Longshoremen’s Association (ILA), the union that represents dock workers throughout the Great Lakes and the Seaway. In 2006, sensing a political opportunity in the decision of Rep. Sherrod Brown (D) to vacate his seat in the U.S. House of Representatives in order to run for Senate, Sutton ran for and won his seat representing Ohio’s 13th congressional district. Sutton won re-election in 2008 and survived the Republican wave in 2010, but redistricting forced her into a more Republican district where she lost re-election in 2012. While in the House, Sutton was recognized as a “key House architect” of the American Clean Energy and Security Act that passed the House in June 2009, primarily for her role in offering an amendment that established the popular “Cash for Clunkers” program that helped the U.S. auto industry weather the worst months of the Great Recession. Sutton’s appointment was greeted positively by Seaway stakeholders. “We could not be more pleased with Sutton’s appointment as Seaway Administrator,” said Donald N. Cree, President of Great Lakes Maritime Task Force (GLMTF), a labor/management coalition that promotes waterborne commerce on the Great Lakes and the Seaway. Sutton currently resides in Copley Township, Ohio, with her husband, Doug Corwon, a mediator with the Federal Mediation and Conciliation Service. Collister “Terry” Johnson earned a B.A. in American Studies from Yale, where he was one of George W. Bush’s roommates. He went on to earn a J.D. from the University of Virginia, in Charlottesville. Johnson began his career as a lawyer, including serving as an Assistant County Attorney in Fairfax County, Virginia; a Deputy Public Counsel of the U.S. Rail Services Planning Office. 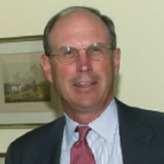 He was an associate partner at the Washington D.C. law firm of Peabody, Rivlin, Lambert & Meyers, and a partner at Lockie & Johnson, also in D.C. Johnson was also a Senior Vice President at WFS Financial Corporation; Chairman of the Virginia Port Authority; President and CEO of FastShip Atlantic; a Senior Consultant at Mercer Management; and a member of the Board of Directors of the Overseas Private Investment Corporation, a position to which he was appointed by President George W. Bush. Johnson was sworn in as administrator of the Saint Lawrence Seaway Development Corporation on October 7, 2006. He is a long-time contributor to both political parties.